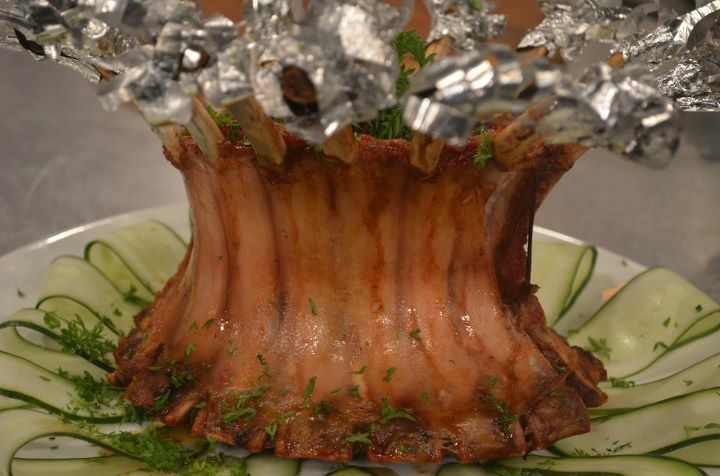 Here's Idol sa Kusina Recipe for EPISODE 25 / Dec. 18- CROWN ROAST. Fill the center of the crown with the stuffing, mounding it slightly. bones in strips of foil to prevent them from charring and snapping off. crown rest for about 10 minutes before carving and serving. 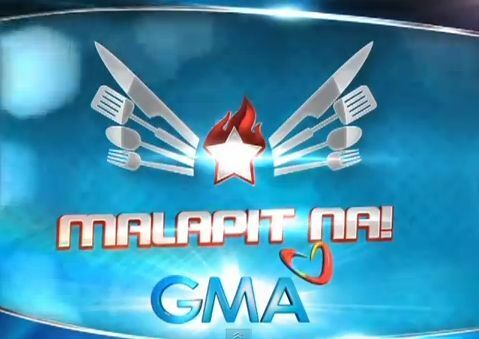 Idol sa Kusina Recipe- GRILLED BUTTERFLIED PRAWNS WITH SAUTEED MUSHROOM TRIO. Here's Idol sa Kusina Recipe for EPISODE 25 / Dec. 18- GRILLED BUTTERFLIED PRAWNS WITH SAUTEED MUSHROOM TRIO. 1. Make the mushroom topping: Season mushrooms with a little salt and pepper. In a sauté pan, melt butter. Add mushrooms and sauté over high heat until brown; set aside. 2. Using the same pan, add olive oil and saute garlic until fragrant. Add mushrooms and white wine. Cook until wine until reduced to half. Add tomato paste and cook for a few seconds. Add chicken stock and season with salt, black pepper, and cayenne pepper. 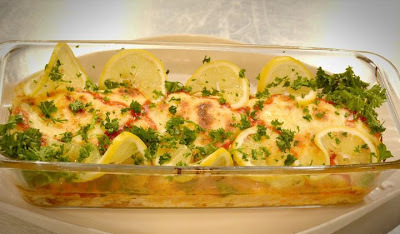 Mix in chopped parsley and simmer for 5 minutes. Add 2 tablespoons butter and mix well. 3. Make the grilled prawns: Season prawns with thyme, salt, and pepper. Drizzle with olive oil. Grill using an electric griller or over hot coals until prawn turn red on both sides. Refrain from overcooking. 4. To serve, arrange grilled prawns on a platter and spoon mushroom topping over the prawns. 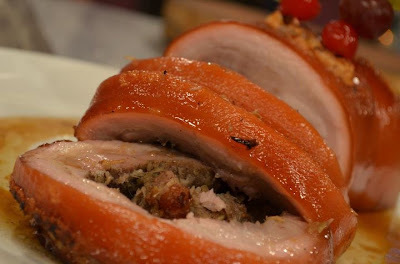 Here's Idol sa Kusina Recipe for EPISODE 25 / Dec. 18- LECHON BELLY - CIOUS. 1.Season pork belly with salt and pepper. Rub the interior of the belly with puree of lemon grass, garlic and onion. Tighten with butcher’s string. 2. Have ready heated oven then roast in oven with pack for 2-3 hour or until tender. 3.NOTE: you may brush with oil fat every 10 minutes to the skin to become crunchy. 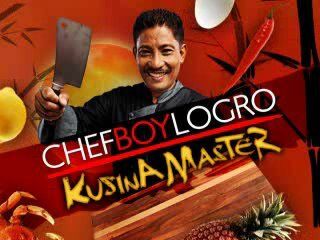 Kusina Master is the upcoming show of most sought after Chef in Philippine TV, Chef Boy Logro. 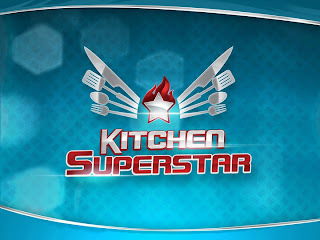 Televiewers will have another reason to enjoy a sumptuous lunch everyday as GMANetwork brings “Kusina Master,” an informative and entertaining daily cooking program, beginning January 2, 2012. “Kusina Master” is a 15-minute cooking show in front of live audiences that will unravel the secrets in making everyday food preparation fun, easy and exciting. 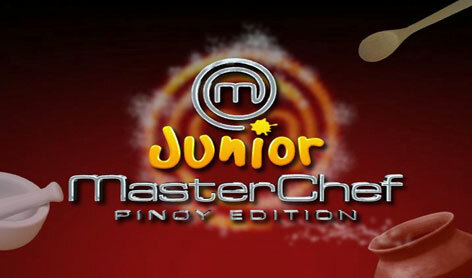 Hosted by Chef Pablo “Boy” Logro, the one and only “Idol sa Kusina,” will guideevery viewer to a step-by-step food preparation with practical cooking tips added with special techniques in making everyday dishes with a “wow” factor. One Kapuso celebrity will be Chef Boy’s co-host every week to assist him in thepreparation of palatable food for every occasion. 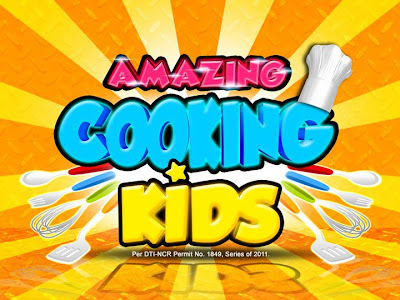 Each episode, on the other hand, will be a cooking experience to one celebrity student who will learn and discover the secrets of how to be a Kusina Master. Watch Chef Boy Logro shares his recipe for the perfect Noche Buena! Nochebuena, (literally "Good Night"), is a Spanish word referring to the night of Christmas Eve. In Spain, Cuba, Latin America, and the Philippines, the evening consists of a traditional dinner with family. 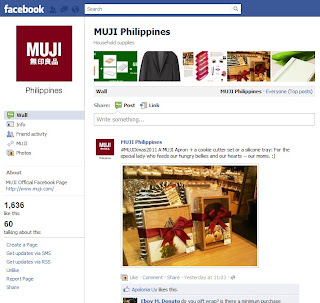 Carrying a massive range of product categories, MUJI is your best bet as the one-stop shopping spot this Christmas. As malls and bazaars slowly pack in crowds of eager and competitive shoppers, MUJI offers you many options as Christmas presents for everyone and for yourself. MUJI makes your Christmas shopping experience a breeze with five (5) trouble-free gift sets of selected items. Well-chosen items are mixed and matched together with every family member or close friend in mind, who would want to receive something special and functional. Buy these items as a set to save 20% on their total purchase amount. 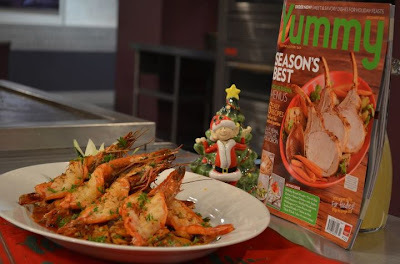 Here's Idol sa Kusina Recipe for EPISODE 24 / Dec. 11- JAMON DE LA PASCUA. 1.Inject pork leg with special blend spices of cola, red wine, salt and white pepper. 2.Cure for 3 days in brine solution. 3.Boil ham leg to tenderness in water with mirepoix. Remove from boiling pot. 4.Have ready roasting pan with pineapple juice, water, mirepoix. Put ham leg in oven with skin of leg removed. 5.Place caramelized sugar on top. 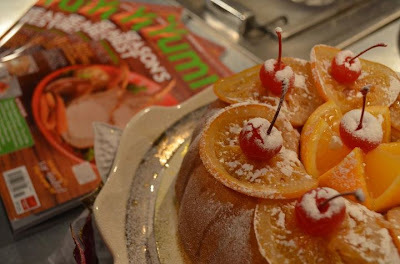 6.Garnish with pineapple ring and cherries. Top 10 Classic Pinoy Christmas Food at "Ang Pinaka"
With host Rovilson Fernandez are guest panelistas: Yvette Tan, Food writer, Chef Edward Bugia, Chef/Owner, Pino,Pipino, Brgy. Bagnet, Burger Project and Chef Sandy Daza, Cooking Show Host/Cookbook author/Foodie/Food Columnist, Phil. Daily Inquirer and his pop-up komentaristas Maey and Betong. 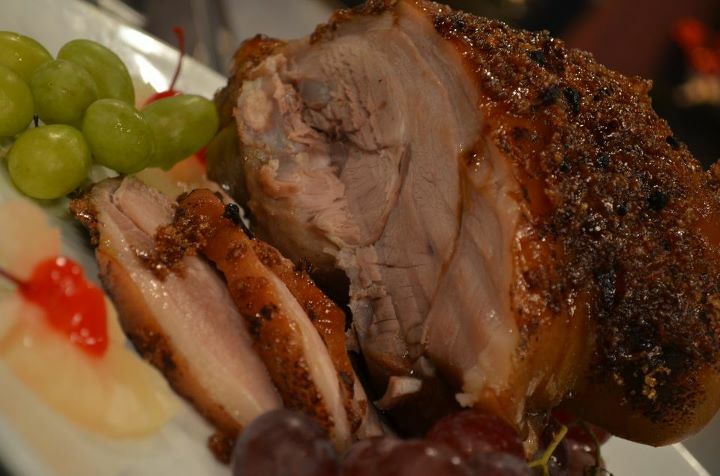 Find out the Top 10 “Ang Pinaka: Classic Pinoy Christmas Food,” this Sunday, December 18, 6:20 PM on GMA News TV Channel 11. Deal Grocer lets you give gifts that offer a taste of the good life. Deal Grocer has partnered with 200+ of the country’s most sought-after hotels, resorts, restaurants, retail stores and beauty brands to offer you luxurious getaways, lavish dining experiences, exquisite retail finds and world- class beauty services—up to 50% off. Here's Idol sa Kusina Recipe for EPISODE 24 / Dec. 11- GLAZED ORANGED POUND CAKE. For pound cake: Preheat oven to 350°F. Grease a 9”x5” loaf pan with butter then dust with sugar; set aside. In a bowl, whisk together flour, salt, and baking soda. In another bowl, combine orange juice and milk. Put butter and sugar in the bowl of an electric mixer fitted with the paddle attachment. Cream butter until pale and fluffy. Mix in eggs and zest. Alternate mixing in flour mixture and milk mixture, adding them in two batches. Pour batter into prepared pan and bake for about 35 minutes or until a toothpick inserted in the center comes out clean. While cake is baking, make the candied orange slices by mixing the water and sugar in a small saucepan. Bring to a boil. Add orange slices. Let cook until liquid is reduced to a thick syrup and the orange slices are tender and translucent, about 20 minutes. Transfer to a wire rack to dry or transfer to a baking sheet and bake at 350F for 10 minutes or until orange slices are dry and shiny. Let cool. Make the orange glaze: In a small bowl, combine sugar and orange juice. Mix until sugar dissolves. Immediately brush the top of the cake with glaze when it comes out of the oven. Cool cake in the pan for 10 minutes; unmold, then brush top and sides with remaining glaze. Garnish with candied orange slices. 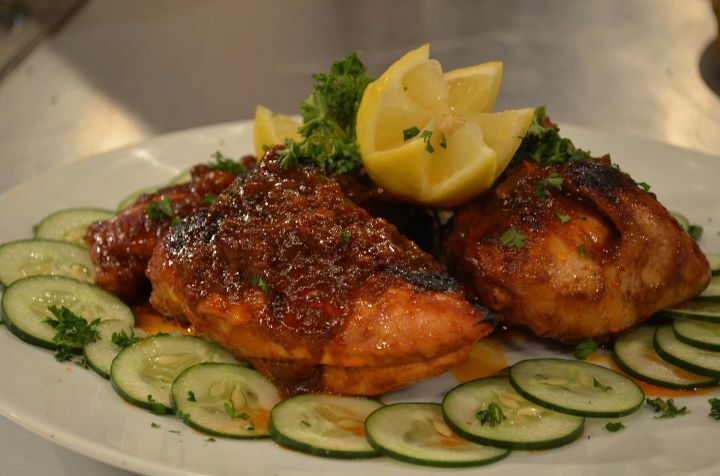 Here's Idol sa Kusina Recipe for EPISODE 24 / Dec. 11- HOLIDAY CHICKEN TERRINE. Trim each liver, removing any yellow or green part. Cut away all connective tissue as well as the fine skin which may cover part of the liver. Marinate chicken livers in bowl and season cubes of chicken meat with salt, pepper, thyme, bay leaf, red wine and cognac. Cover bowl with plastic wrapper and leave to marinate in refrigerator for 6-8 hours. Remove thyme, bay leaf, before grinding meat. Combine ground liver and chicken meat in large bowl. To bind meat mixture, stir in 2 eggs one at a time blending thoroughly after each egg to assure smooth consistency. Add cream and pistacchio nuts, stir until fully incorporated. The terrine molds should be perfectly clean and dry. Line the molds with deboned chicken pieces which should be large enough to eventually cover top of terrine. Trim chicken if necessary and fold it over top to cover completely. If mold does not have a cover, use double thickness of aluminum foil and press firmly around lip of mold to hold it in place. Pierce foil with tip of a skewer to make air vents so that steam created by terrine can escape during cooking. Place the terrines in water bath high enough to bring water half way up the side of molds. 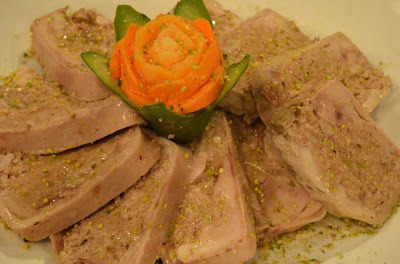 Cook terrine in low oven 170°C (340°F). The cooking time will depend on size of terrine. After terrine has completely cooked, refrigerate. What are you able to do now with your 24 hour smooth hair? Have you ever experienced tying your hair in the afternoon just because your hair can’t stay smooth all-day long? Many girls’ conditioners cannot promise this 24-hour hair smoothness that Pantene Intensive Conditioner provides women because Pantene has 80% more conditioning ingredient vs regular conditioners. This innovation from Pantene has broken the habit of many women, guaranteeing them 24 hour smooth hair. 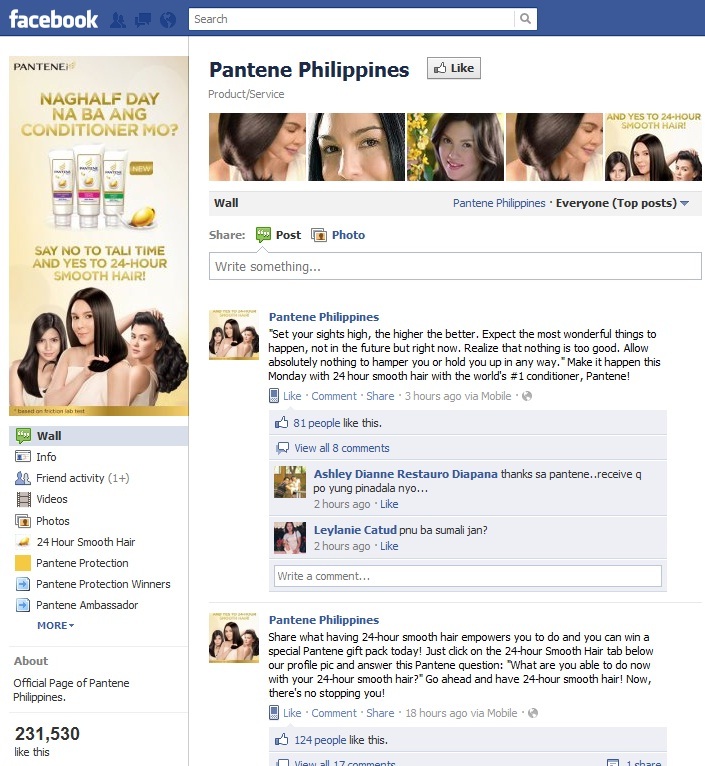 Pantene Intensive Conditioner allows them to do whatever they want without worries of having tangled and dry hair. 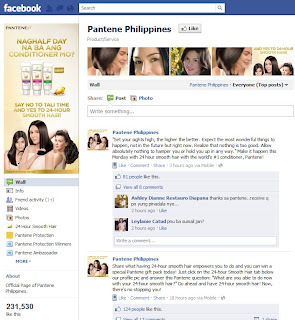 So you, what are you able to do now with your 24 hour smooth hair from Pantene Intensive Conditioner? 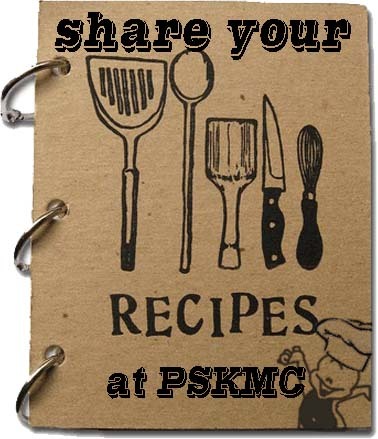 Share your story now! Based on a study conducted among women, 90% of whitening cream users actually suffers from skin ageing. A lot of women are not aware that when they reach a certain age, their whitening cream is not enough; they need an anti-ageing cream like Olay Total Effects to address both whitening and anti-ageing needs. 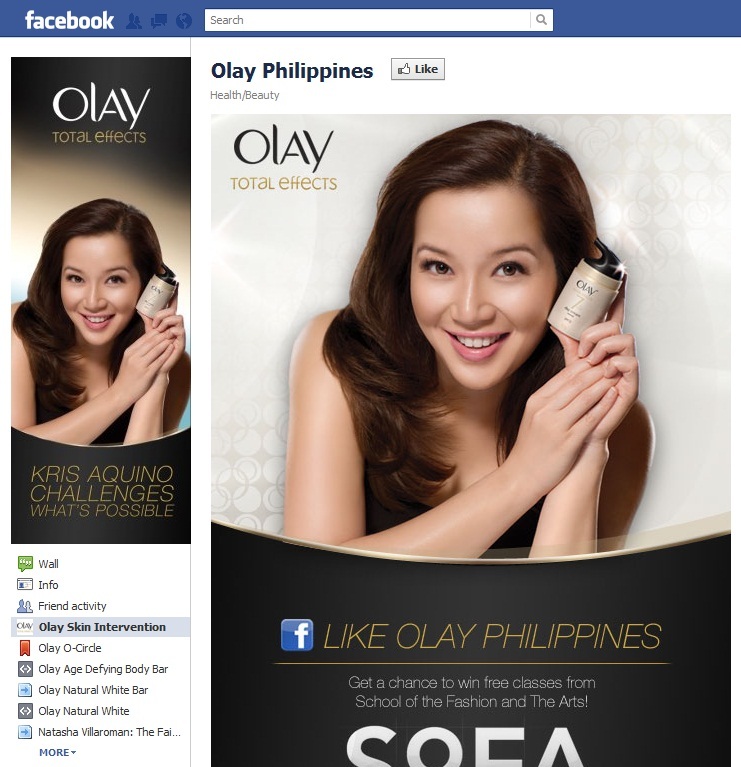 A good test whether a woman needs an anti-ageing cream like Olay Total Effects is to compare their pictures from afar and their pictures up close. A woman who already needs an anti-ageing cream but only uses a whitening cream may look fair from afar but up close, she would have signs of ageing like lines and wrinkles. Here's Idol sa Kusina Recipe for EPISODE 23 / Dec.4- SHRIMP PASTA SALAD. 1. Skewer prawns in bamboo sticks then blanch into boiling water with wine, salt, leeks, celery and U.S lemon until pink, keep cool for some time. 2. Unshell prawns, but leave head & tail. Remove bamboo sticks, then cut into butterfly (shrimp sushi cut). 3. Place cocktail glass on platter and arrange the shrimps around the glass, then surround with pasta salad. 4. 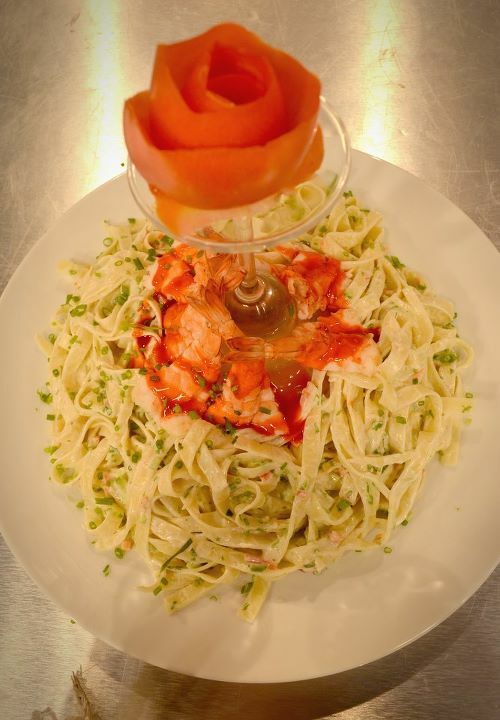 Combine tagtiatelle pasta with mayonnaise, celery, spring onion, red and green bell pepper, salt and pepper. 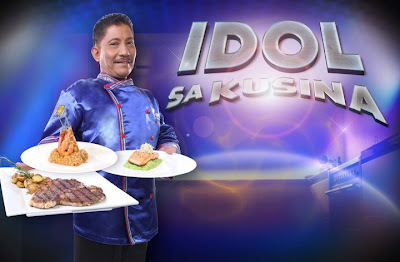 Here's Idol sa Kusina Redipe for EPISODE 23 / Dec.4-WHITE CHRISTMAS CHICKEN BARBEQUE. 1 whole chicken, sliced into 4 pcs. 1. In saucepan, combine tomato sauce, water, molasses, catsup, butter vinegar, onion, Worcestershire sauce, dry mustard, salt, pepper and chili powder. 2. Simmer mixture 15 – 20 minutes, set aside. 3. Brush halved portion chicken with salad oil and season with salt and pepper. 4. Place bone side down on grill. Boil over slow coals or pan griller, 25 minutes, turn, broil 20 minutes. Brush with sauce. 5. Continue broiling, turning occasionally and basting with sauce 10-15 minutes or until tender. 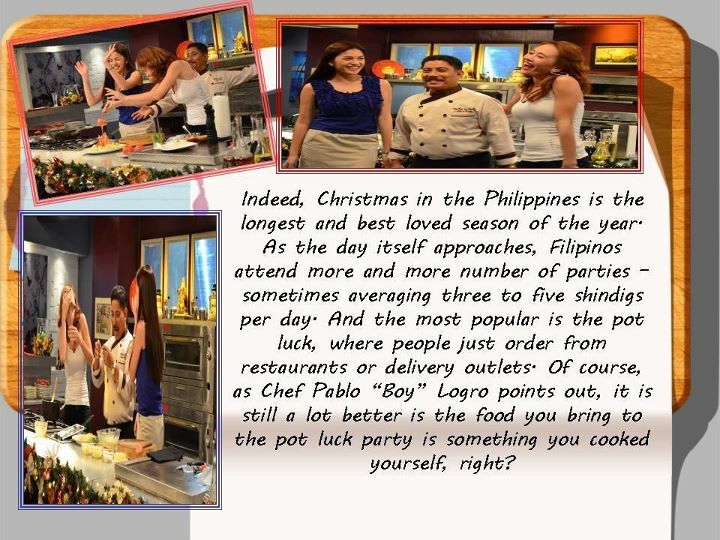 Here's Idol sa Kusina Recipe for PISODE 23 / Dec. 4- MEAT LASAGNA a la SANTA. Watch Idol sa Kusina Episode December 4 2011- CHRISTMAS POT LUCK with Chariz Solomon and Andrea Torres.